The Adidas Pharrell Williams Stan Smith Mens Tennis Lifestyle Shoe features Electric colors art details and fun sophisticated style for all. Musician and creative force Pharrell Williams teamed up with adidas Originals to design a signature line that infuses his positive vibes with some of adidas most iconic pieces. 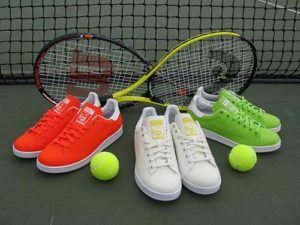 His colorful twist features a textured upper crafted in fuzzy tennis ball material perforated 3-Stripes and the authentic Stan Smith rubber cupsole. Each sneaker is finished with Pharrell Williams signature graphics on the heel and footbed.